The following may or may not have had to do with my experiences in several offices in my lifetime. This is long overdue. While bringing in leftover tuna casserole seems like an incredible idea, because you know, it tasted oh so delicious when it was fresh out of the oven last night, you have no idea what this is going to smell like when you microwave it in an enclosed space. Indeed, an entire small office or whole section of a large one will definitely reek of day-old baked fish and cheese for hours if you make this decision. Kindly don’t. Who doesn’t love the smell of buttery popcorn? On the other hand, burnt popcorn smells like one of two things: a) Satan’s indigestion or b) burning hair. Ergo, please know how to make popcorn in the microwave (i.e., listen for the slowing down of the popping kernels and check that a burn hole isn’t being made on the bag). Mmm, leftover spaghetti with meatballs. What’s that? You underestimated how quickly the tomato sauce would heat up and now there’s an explosion of red sauce clinging to every available surface on the inside of the microwave? Please grab some wet paper towels and wipe it down. The question, “Do you do this at home?” shouldn’t be asked because it’s clear that it is what you do at home. So the real issue is that you’re NOT at home and you SHOULD be courteous to anyone else who wants to use the microwave after you. It takes way less time to clean up freshly exploded sauce than dried on sauce. Use your best judgment. If it is made with lots of salty chemicals and preservatives, most likely it’s going to make the entire kitchen and surrounding area smell like reheated cat food. Unless you’re this lady, none of us are interested. In fact, some of us may become severely nauseated. Cauliflower, brussels sprouts, cabbage, broccoli, asparagus, have I mentioned fish?, sauerkraut, etc. These are NOT to be microwaved in a communal setting. 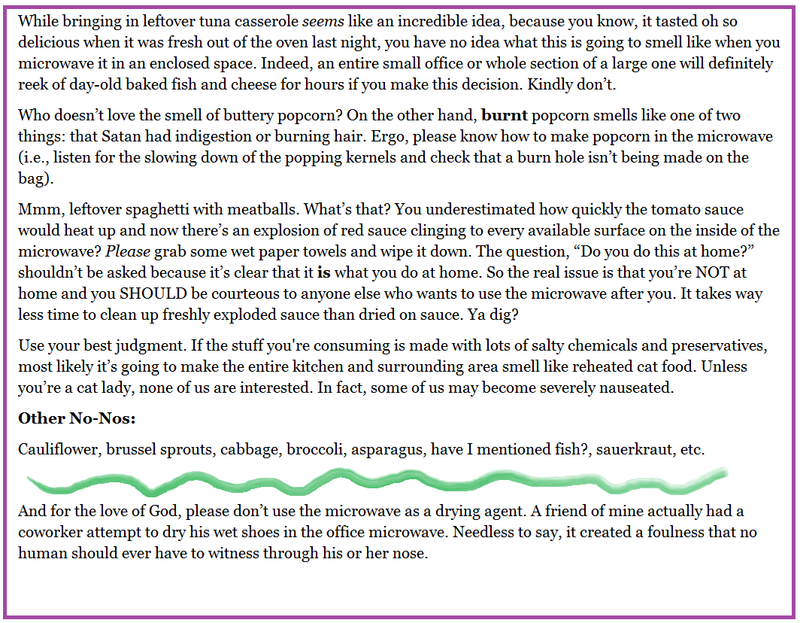 And for the love of God, please don’t use the microwave as a drying agent. A friend of mine actually had a coworker attempt to dry his wet shoes in the office microwave. Needless to say, it created a foulness that no human should ever have to witness through his or her nose. This has been a public service announcement. Please pass along as appropriate. First of all, the title is dead on here. Secondly, great post, except there’s nothing wrong with reheating the following: Cauliflower, broccoli, brussels sprouts. And soup is okay if it’s clam chowder. sorry, kevin. wrong about broccoli. one day i microwaved a sad, frozen lunch thing that happend to have a stalk or two of broccoli. the whole office smelled like the cage of a sea sick elephant. i felt terrible. and i had a coworker who would microwave broccoli soup on the regular. the office became a chemical war zone. we lost a lot of lives that way. Hahaha great analogy! Indeed, I have also had the experience of someone microwaving broccoli and me wondering if someone didn’t have really bad gas. Sounds like a valuable learning experience, Mr. Train. Haha I knew you were going to mention clam chowder! That is on the list of Offensives! This post made me ‘LOL’! I can sooooo relate. Wet socks and shoes are definitely on the FORBIDDEN list.